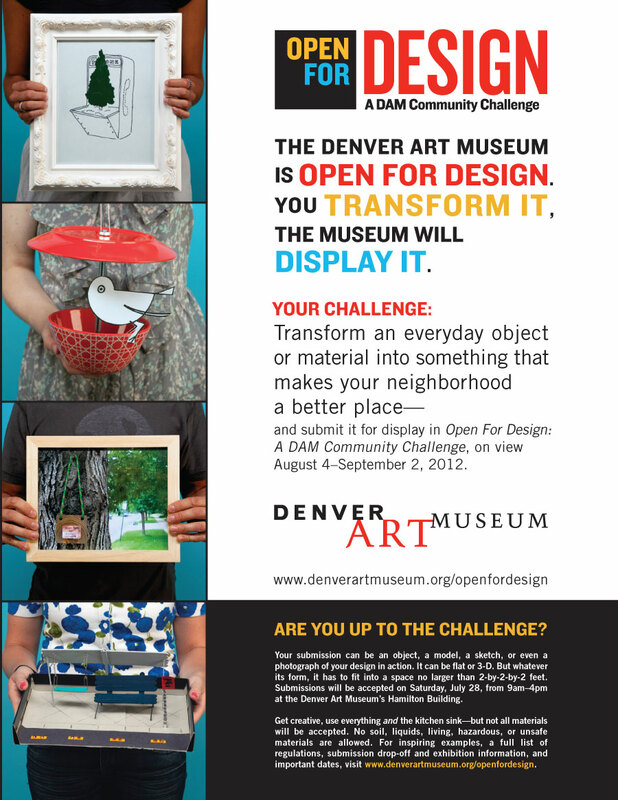 I’m excited to announce the Denver Art Museum‘s community design challenge, and first ever public-sourced exhibition this summer, Open For Design. Our initiative is to display Colorado’s creative man power with this exhibition. Our challenge to the community it to transform an everyday object or material into something that makes your neighborhood a better place. Simply put, we want this exhibition to have lasting everyday significance! Submissions can take many forms, from objects and pictures to sketches and models. With just over a month until drop-off day on July 28, now is the ideal time to get started designing! We’d love your help spreading the word about our challenge and getting people excited! You can invite friends from our Facebook event page, and anyone interested should also visit the exhibition webpage, www.denverartmuseum.org/openfordesign. Since this is the DAM’s first stab at a public sourced show, word of mouth is definitely our most valuable asset. Tell your friends!